From Gundagai, follow the Sturt Highway into town to the traffic lights at the intersection of the Highway (Edward St) with Best Street. Turn left into Best St which becomes Mitchelmore Street. Dunn's B&B is on the left, one house back from the corner of Blamey Street, which is two blocks up from the roundabout. If coming from Melbourne, turn right at the Best St lights. Magnificent Federation Home. Old world charm featuring brass beds, mahogany tables and country hospitality. Complimentary pick up from airport or train station in Vintage Buick. Dunn's B&B is just a short stroll from Willans Hill and Wagga's beautiful Botanic Gardens. 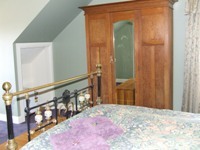 Dunn's B&B is a spacious family home with three generous bedrooms furnished for comfort with elegant appointments. Each room contains a brass double bed with a doona made to snuggle into, table and chairs with good light to work by, modern ensuite, television, tea and coffee making facilities and refrigerator. 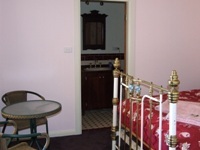 Guests have the use of their own sitting room and balcony upstairs or they are welcome to join our family downstairs. We cater for holidaysmakers and business travellers and are happy to adapt to your needs. There are facilities for wireless internet, undercover parking and a private entrance. We also provide homemade afternoon tea, maps, complimentary vintage car ride and friendly service. Quiet, airy room with ensuite, including generous shower. Brass double bed, classic elegance, excellent amenities. Easy access from off road parking. Complimentary home-made afternoon tea or supper. Continental or full breakfast in our elegant dining room with eggs straight from our chooks. Light and airy large room with ensuite. Brass double bed, classic elegance, excellent amenities. Working area with good light. External access from undercover parking via back stairs. Continental or full breakfast in our elegant dining room with eggs straight from our chooks. Complimentary afternoon tea or supper. Cheery, light and airy room with ensuite. Iron double bed, classic elegance, excellent amenities. Working area with good light. External access from undercover parking via back stairs. Complimentary home-made afternoon tea or supper. Continental or full breakfast in our elegant dining room with eggs straight from our chooks. Full refund if cancelled 7 days prior. 20% cancellation fee applies if cancelled up to one day prior. No refund on the day.